Remarks as delivered by Wisconsin Lt. Gov Mandela Barnes on behalf of the Working Families Party (WFP) - read here. Bernie Sanders responds to SOTU, just as he has done for the past two State of the Union speeches. The Green New Deal should add FDR's Labor Bill of Rights to its campaign. Together they amount to a whole new day ! 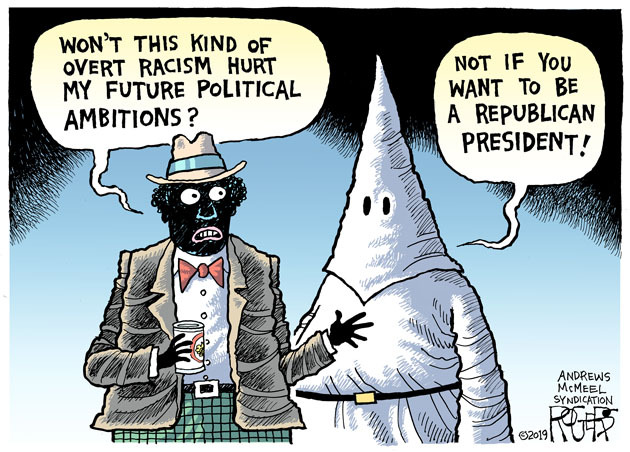 The latter were being proposed by FDR in the days before he died ! *"As US manufacturing boomed...emissions from the nation's industrial sectors -- including steel, cement, chemicals and refineries -- increased by 5.7 percent. "Policy-makers working on climate change at the federal and state level have so far largely shied away from regulating heavy industry which directly contributes about one-sixth of the country's carbon emissions." *Only the Times would use the term "shied away from" to describe the government's complicity in causing the disaster we all will have to live with -- or not. *Isn't it time to focus the struggle on a real enemy -- big-business? How is that even a thing ? How would the government go about enforcing it ? And if I wanted to buy a widget and I chose the Japanese widget over the Israeli one, how long before the police show up at my door ? States make you sign an oath, as a condition of getting employment or disaster assistance you are not, nor do you plan to engage in a boycott of Israel or threaten their economic interests. So, if boycotting Israel is going to be illegal, what will it be mandatory for me to buy from there? Go do it now and save your Nation. Protect your rights to speak out. Here https://portside.org/2019-01-31/kennedy-king-and-malcolm-families-congr… is a listing of the one of the most profound collaborations in America's history to, finally, call for Congress to reopen investigations into the assassinations of American leaders John F. Kennedy, Robert F. Kennedy, Martin Luther King Jr. and Malcolm X . Please see the sizable list and biographies below of all those calling "for a Truth and Reconciliation Committee to get to the bottom of these tragic murders". I personally thank all of those signing on to this initiative and was thrilled when I saw this declaration below to investigate the painful loss of America's leaders who worked and advocated for justice. I greatly value your postings. However, in this case we are presented by an article by a dreamy lefty, unwilling to face the simple fact that the rhetoric of the left can also be used to subjugate, steal from, starve, and kill "the people". Maduro in Venezuela is a thug. He is destroying "the people". But the author seems unaware of this. Before setting pen to paper, the author should visit and talk with actual people--not government stooges or other dreamy lefties--in Venezuela. I am not sure how Portside can screen articles might be able to screen out like this. An essential first step would be not to assume that, just because it is from the left, it is a worthwhile contribution. Is some form of external review possible? Again, I think Portside is, overall, an excellent resource, and I thank you for that. I have been reading many articles on the Venezuelan crisis. Even the better ones, such as Marjorie Cohn’s piece in Truthout, I think leave out important elements of the story. The linked article from Portside talks about the system of “duel power” that was institutionalized in Venezuela, beginning at the dawn of the 21st century. It discusses communal political and economic institutions initiated by the Bolivarian Revolution to empower the grassroots base of the revolution. In 2006 at the CCDS https://www.cc-ds.org Convention in Chicago we heard from a guest speaker who was a mayor of a modestly-sized city in Venezuela, discussing duel power. The traditional city council, largely controlled by the locally rich and powerful, was challenged by a communal council. The BR had given power to these communal councils to have input in the allocation of local resources. I have no expertise on the magnitude and effectiveness of these grassroots developments and I do not know about the author of the Portside article but he does describe this reality. I did see an excellent documentary on the Pink Tide, then in Brazil, Bolivia, and Venezuela. It showed a scene where one of these communal councils demanded government resources for local housing construction. The people in the community raised hell and forced Chavez to allocate resources that his government had originally vetoed. In other words, as the Portside article suggests, there may have been and still exists people power that remains the source of support for the Bolivarian Revolution. This brings me to the second point. I think the drive for oil as an explanation is exaggerated. Sure it is force. But in my judgement, what the Bolivarian Revolution or the “pink tide” represents (or represented) is as fundamental challenge to US economic and political hegemony in the hemisphere. It is the same fear ruling classes have about workers, peasants and farmers, the precariat, women, people of color rising up to take power, even in the United States. And as the recent Wall Street Journal report suggests, the ultimate prize in Latin America is overthrowing the Cuban Revolution. So in my opinion, solidarity should include a discussion of the gains and visions of the Bolivarian Revolution and a clear argument that its defeat will not only be a defeat for Latin Americans but ultimately for all of us. I look forward to discussion on this. this is a fantasy, considering current conditions. While U.S. backed Right-Wing countries in Central and South America are driving millions out as refugees, our government is using illegal means to punish and threaten Venezuela (and Cuba) ! 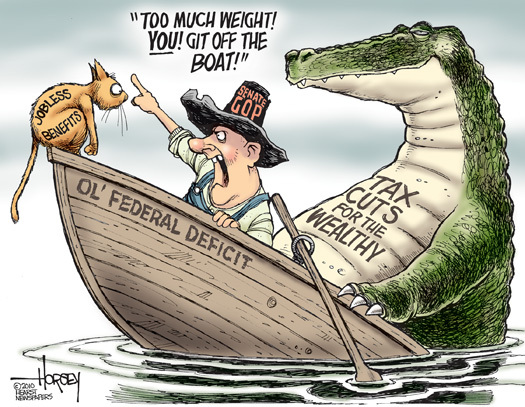 The unspoken assault on poor and working peoples is threatening the economies and lives of millions! This is possibly the strangest and most delusional article I've ever encountered on the topic of Venezuela. The inflation is over 1,000,000% / yr, the currency is absolutely worthless. Caracas ranks among the deadliest cities on the planet, violent crime and gang warfare is completely out of control. People are fleeing by the millions. This is the shining example of the people's socialist paradise? Really??? Of course, you did not mention anything about the years of intervention by China (no, not the US, China). China has "invested" over $70 billion in various projects, with the proviso that this debt be paid in oil. Of course, because of incredible mismanagement and corruption, combined with the falling price of crude on the open market, China has become evermore anxious to preserve the current dysfunctional and corrupt government, knowing all too well it will probably never recover its owed debt should the current regime change. And change it will, as is happening now. But no, you just want to on endlessly about the workers committees and various experimental governance agendas that bear no semblance at all to what life is really like there. It's very sad to be so hopelessly delusional. I do hope eventually the people of Venezuela can eventually rescue their country from this ridiculous current situation . . . and get out of debt to China. Is this to real for you? The U.S. overthrew the Guatemalan government and instituted what would become a 40-year nightmare of state-organized mass murder that ultimately cost 200,000 lives. The Chilean effort to build a humane economy was ended with the overthrow of Salvador Allende and the installation of Augusto Pinochet and his murderous regime that immiserated Chileans. Dissimilar results can hardly be expected if the U.S. were to succeed in overthrowing the Venezuelan government and installing a right-wing government that would reverse the many gains of the past 20 years. Hands off Venezuela! I read your most recent post from a link in Naked Capitalism. It's good insight into what the revolution has done for poor people, and yes of course you don't fail to mention the harm caused by US sanctions. But you attribute Maduro's own shortcomings to only "poor management." Not a word about the Mafia Gangster Nation Venezuela has become in the past few years. Only the Democratic Socialists of America put out an explicit statement condemning Trump’s move.? "The Communist Party USA calls on all our members and friends to immediately contact their senators and representatives to demand an end to this illegal and dangerous intervention in the affairs of a sovereign nation which has done nothing to harm our country or its people." Not only is it realistic, it is absolutely necessary. 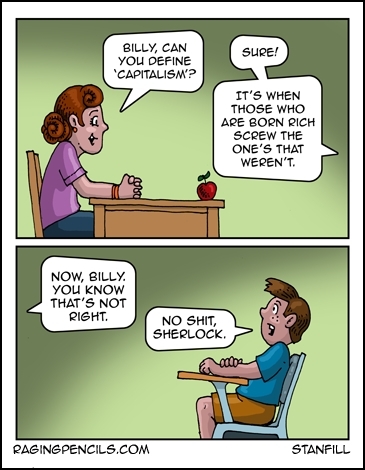 Only the corporate class and neo-liberals contest it. According to your own history, this is still lower than it was in the 60s. When your economy was doing great. The 70% is at the 10 million mark and over.. if you hit the 10 million mark in profits I bet 100% you have dogged paying taxes on most of that already. Right. But what about LGBTQ rights? This is great piece. I remember reading other work by Steuben back in the day. Nice to know his personal history too, though hardly surprising. I am sorry that McAlevey feels the need to dis those organizing among contingent workers (gig workers) and people who are organizing demonstration strikes. They are not useless and can be useful buildups to real power strikes, as she herself mentions in the UE example (or the more recent CWA tactic “just practicing”). Her list of the basic industries that employ key elements of today’s US working class is spot-on (logistics, education and health care) as is her analysis of who is in these sectors. She might well have linked this to the casualization of all three of those sectors (if not the gig economy, certainly more and more contingent workers) with contingent college faculty (and even K-12 teachers and staff), traveling nurses and health care workers, the massive logistics warehouse with mostly subcontracted workers and the misclassified-as-independent-contractors port-truckers. Because I see no mention of what happens to those currently being paid for pushing papers around as workers in the insurance/payment/non-payment system, I assume that part of the savings would come from dis-employing them. And if their disemployment is part of the claimed cost savings, what would it cost to help them move to other employment, or support them during their attempt to find other employment? And where will that payment come from? Society and economy suffer from fragmented thinking, with claims of savings in one place with silence about the costs they impose on another, and too little comprehensive discussion. It's ONE big interactive systems. Do the Single-Payer or Medicare for All campaigns have something in mind for those many thousands to be displaced? I like Single Payer / Medicare for All; I'd like them even if there will be NO savings to government or society from instituting them. And I believe the campaigns for them would be all the stronger if advocates could show what they have in mind for the employment casualties. So if renewable energy sources will provide electric for 65% to 80% needed electric, from where does the other 20% to 35% come? Ruth Werner's powerful book 'Olga Benario' was an inspiration to me as a young woman, and her daughter is right, Olga's story can inspire young women today. Since the last decade of the nineteenth century, the struggle against the mafia has been a struggle against the power of both the ruling classes and their allies; indeed, the mafia itself has over time merged the two categories. Interesting review from Monthly Review distributed by Portside in yesterday's email blast. There was one curiously problematic item in the review, "[in] the Preface, Noel Paul Stookey (Paul of Peter, Paul and Mary) recalls sitting with his dad listening to a radio report of the Atom Bomb test in 1945, and a few months later sharing joy at the American victory over Japan." The thing is, the Atom Bomb test in 1945 that was a few months before the American victory over Japan was conducted in secret, at a remote location with a cover story that a remote ammunition magazine on the base had exploded. Only that cover story (and reports of what civilians had seen from far away) made local news at the time of the test, and it wasn't reported nationally. Information on the test was released and widely reported after the bombing of Hiroshima, but that was days before Japan's surrender, not months. The authorities in the State of Washington should pursue legal action charging the parents of these children. Criminal Mistreatment in the Second Degree is a class C felony punishable by up to 5 years in prison and/or a fine of up to $10,000. Felony 2 causing substantial bodily harm by withholding basic necessities of life. Undocumented adults are mostly left out of California’s health insurance system and make up the largest group of uninsured in the state. Low-income undocumented adults have an especially high uninsured rate—90 percent—and are more likely to lack a usual source of care than their counterparts with citizenship or documentation, according to UCLA analysis. Expanding Medi-Cal to all low-income adults regardless of immigration status would extend eligibility to approximately 1.15 million undocumented adults in 2020. Expanding Medi-Cal to low-income undocumented adults would close one of the biggest remaining coverage gaps in the state’s health care system, reducing the state’s uninsured population by as much as one-quarter. Research has shown the value of health insurance for health, access to care, financial security, and worker productivity. Under a scenario in which all restricted-scope enrollees are automatically transitioned to full-scope Medi-Cal coverage and additional eligible individuals newly enroll, approximately 1.05 million undocumented adults would be predicted to enroll, of which 104,000 are estimated to be young adults age 19-25 and 25,000 are estimated to be seniors age 65 and over. Proposed changes to federal immigration rules threaten to have a chilling effect on enrollment in public programs, even among those individuals not directly affected by the proposed rule change. If the proposed “public charge” rule is finalized and the disenrollment rate among undocumented adults is relatively high (35 percent), the expansion would extend full Medi-Cal benefits to approximately 680,000 undocumented adults in 2020. Are commonly parents of citizen children—approximately one out of six children in California has an undocumented parent. Read full report here (PDF). 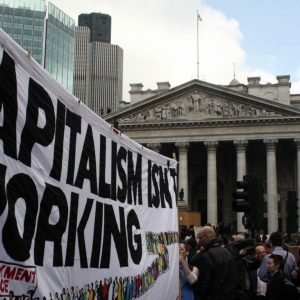 Less than two decades into the twenty-first century, it is evident that capitalism has failed as a social system. The world is mired in economic stagnation, financialization, and the most extreme inequality in human history, accompanied by mass unemployment and underemployment, precariousness, poverty, hunger, wasted output and lives, and what at this point can only be called a planetary ecological “death spiral.” The digital revolution, the greatest technological advance of our time, has rapidly mutated from a promise of free communication and liberated production into new means of surveillance, control, and displacement of the working population. The institutions of liberal democracy are at the point of collapse, while fascism, the rear guard of the capitalist system, is again on the march, along with patriarchy, racism, imperialism, and war. With the far-right on the rise globally, a viable left-wing alternative movement is urgently needed. In the United States, a growing socialist movement seeks to confront and defeat Trump's toxic mixture of racism, misogyny, isolationism, and empty “anti-establishment” rhetoric, as well as the bi-partisan status quo that gave him room to rise. This reborn socialist movement faces many questions about strategy—especially in its approach to electoral politics. 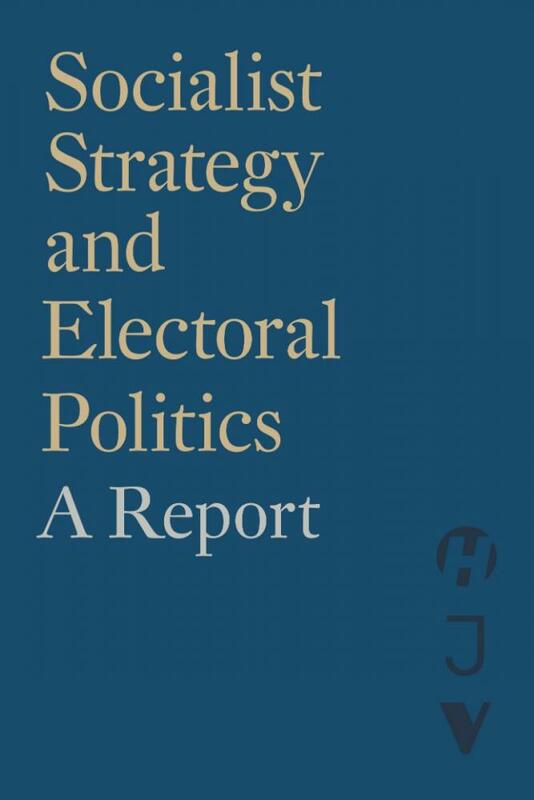 As a contribution to that conversation, Haymarket Books has collaborated with Verso Books and Jacobin Magazine to put together a FREEEbook, Socialist Strategy and Electoral Politics: A Report, along with a Haymarket Books reading guide on the history, theory, and politics of socialist strategy and the state. In this collection of new and previously published essays, activists and scholars from across the socialist left seek to grapple with politics in the wake of the election of Donald Trump and the surprising popularity of Bernie Sanders' primary campaign in 2016, as well as the failure of center-left parties across the world to halt the ascent of right-wing populism. They refuse to be satisfied with asking, “Who can we get elected to office?” Instead, they consider how and why socialists should participate in the electoral arena. Some reflect on the possible gains: that through electoral campaigns our ideas might spread and our ranks could swell, or that we might learn valuable lessons for the next fight. Other contributors argue that we should pay more attention to those who are left out of electoral politics—the disenfranchised, the undocumented, the poor—and be wary of the narrowing of horizons that is, in general, the result of governing. 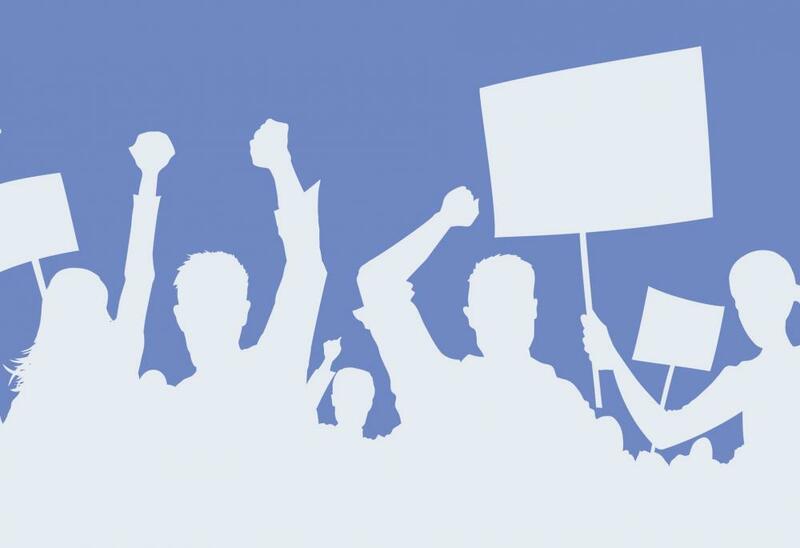 Despite these disagreements, the goal of all contributors is to help the left understand where it should go from here, and inspire those not yet organized and active to join the growing socialist movement. Contributors include Seth Ackerman and Daniel Denvir, Sofia Arias, Sumaya Awad, and Bill V. Mullen, Ben Beckett and Neal Meyer, Eric Blanc, Todd Chretien, Danielle Corcione, Ariel Diliberto, and James Yeun, Meagan Day, Barry Eidlin, Nick Estes, Ted Fertik, Lauren Fleer, Sam Gindin and Leo Panitch, Charlotte Heltai, Matthew Karp, Kim Moody, Charles Post, Aziz Rana, Kshama Sawant, Lester Spence, Keeanga-Yamahtta Taylor, and the Viewpoint Collective. Join us for the exclusive opportunity to learn from and speak with two high-ranking officials from the new Mexican government led by President Andres Manuel Lopez Obrador. 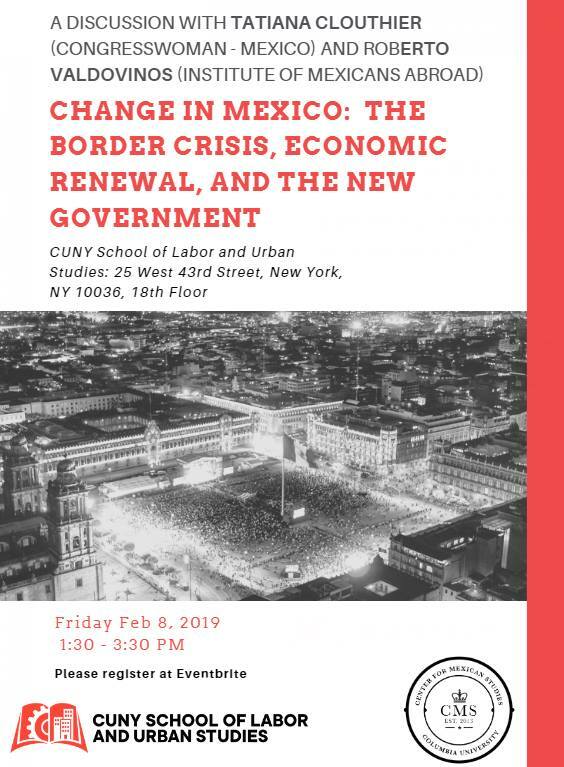 The speakers will address a wide range of topics relating to U.S.-Mexico relations, migration, economic renewal, and MORENA coalition's approach to leading the new government. Herb Boyd (Moderator), award-winning journalist & book author. Bill Fletcher Jr., acclaimed labor journalist & social justice advocate. JP Howard, widely acclaimed poet, author, educator, and curator. Yusef Salaam is the author of The Devil & Elijah Muhammad and a children’s book, Elijah Muhammad: Builder of a Nation. Raymond Nat Turner: Poet-in-Residence at Black Agenda Report, WBAI's Morning Metro, Ralph Poynter's "What's Happening?" Blog Talk Radio. Eartha Watts-Hicks, award-winning author and marketing consultant. 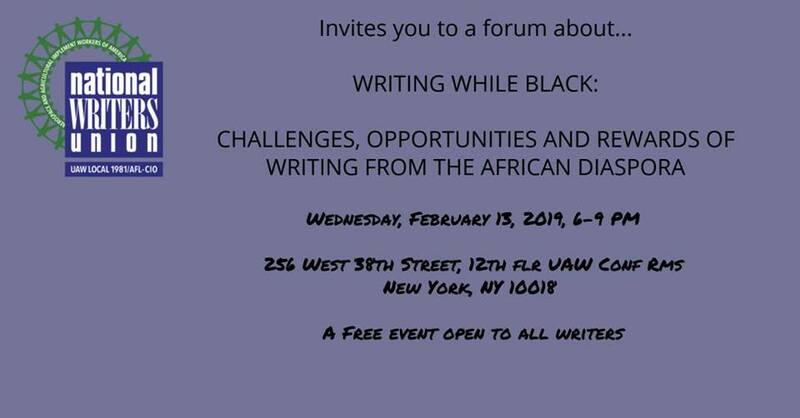 A Free event open to all writers. What accounts for the lack of attention toward developing a progressive foreign policy platform? What would such a platform consist of? 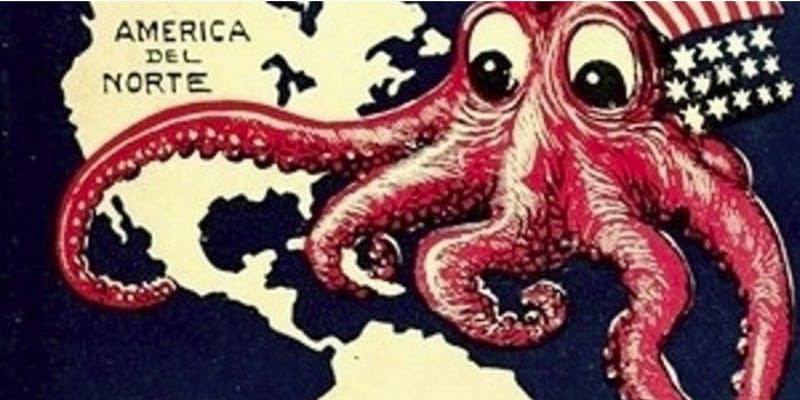 What would a non-imperial vision of the U.S. in the world look like? What current alliances would such a platform call into question? What are the current possibilities and the substantial obstacles to advancing a contemporary progressive vision for foreign policy? What can we expect from the growing progressive wing of Congressional Democrats? Join us on Friday, March 1 as Aziz Rana of Cornell Law School presents his take on the potential elements and strategies of a progressive U.S. foreign policy. Steve Fraser of the New Labor Forum will moderate. Presented by NYU Skirball and the Asian/Pacific/American Institute at NYU. Co-sponsored by NYU Sanctuary, NYU Center for Multicultural Education & Programs, Islamic Center at NYU, and NYU Hagop Kevorkian Center for Near Eastern Studies. Paula Chakravartty is associate professor in the NYU Department of Media, Culture and Communication and the NYU Gallatin School of Individualized Study. Her research and teaching interests span comparative political economy, social movements and global governance, and decolonial and critical race theory. Her books include Race, Empire and the Crisis of the Subprime (Johns Hopkins University Press, 2013), Media Policy and Globalization (Edinburgh University Press, 2006), and Global Communications: Towards a Transcultural Political Economy (Rowman & Littlefield Publishers, 2008). Recent publications include a special issue on “Mediatized Populisms: Inter-Asian Lineages” for the International Journal of Communication (December 2017) and “Infrastructures of Empire: Towards a Critical Geopolitics of Media and Information Studies” for Media, Culture and Society (2016). Her current research focuses on racial capitalism and global media infrastructures, and migrant labor mobility and justice. Chakravartty is a member of the NYU Sanctuary Coalition and the NYU Coalition for Fair Labor. She serves on the executive board of the NYU Association for University Professors (AAUP), and is affiliated faculty at the Asian/Pacific/American Institute at NYU, South Asia at NYU, and the NYU Hagop Kevorkian Center of Near Eastern Studies. 2nd Amendment Passed to Protect Slavery? No!